Payload products are all about safe access to the work area, Ladders, Step-overs, Walkways and handrails. Read here about the many occasions when both standard and bespoke Payload designs provided the perfect solution. The Sayfa Payload range is designed to complement the Sayfa range of Aviator roof safety products by enabling safe access to the work area. 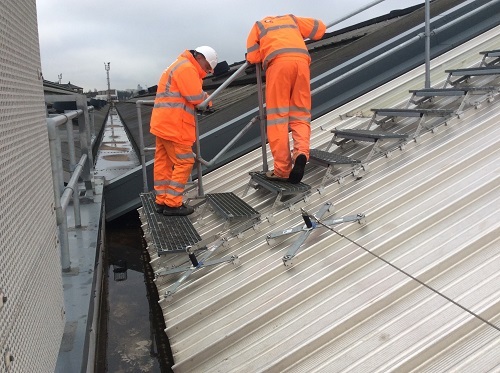 We design make and install bespoke ladders, walkways, step-overs and Safety rail to meet the needs of any access requirement to ensure that maintenance can be carried out in a safe and effective environment. All access safety equipment requires by law an annual inspection to ensure it is still safe to use. At Sayfa we have a specialist team of safety re-test engineers who are always available to inspect advise and re-certify any safety access equipment, to ensure it meets the current legal standards. Using Sentry Rail there is complete flexibility in the positioning of upright posts so you can configure the system to fit around virtually any arrangement of roof furniture or cabling. The product information below is from the NBS Plus library of product clauses offered in NBS specification products. It has been created by NBS for SAYFA Systems UK Ltd. The clause is authored in NBS format and is intended for inclusion in project specifications. The clause can be copied and pasted into your project specification document. Please note that NBS product guidance is not a replacement for the manufacturer's literature and it is recommended that SAYFA Systems UK Ltd be consulted before specifying.